Day two and three of my Enchantments trip report from July 17-19, 2008. Enjoy! After sleeping somewhat fitfully through a windy night, I woke the next morning just before the sun began to peak over the horizon. McClellan Peak was glowing and I was itching to get a summit under my belt. I said good morning to our goat friends, then grabbed a couple of granola bars and headed toward McClellan. In the shade, temperatures were near freezing but I was comfortable hiking in shorts, a fleece, and a hat until reaching the sunlight. From the start, this climb had me completely entranced. Warm morning light splashed across the granite, rock slabs perched precariously overhead, ridiculously blue skies, a challenging scramble where I was forced to make route decisions, and initial sweeping views of the entire Enchantments vicinity. I ended up picking a line that took me right past the spires looming overhead. I was a little confused when I found a sling (piece of climbing protection) partway up my route as it didn’t seem terribly challenging, but looking down did reveal a fair bit of exposure. And when I straddled the ridge a vertigo-inducing drop loomed on the other side. After passing the spires I topped out on a grassy plateau which very well could’ve functioned as one of the world’s greatest picnic spots (bottom right picture). Surrounded by flowers, Mount Rainier in the distance. I snapped a bunch of pictures from here (including this panorama of the Enchantments) before heading up a very fun finishing scramble to the summit (elevation 8347 ft). I signed the summit registry, basked for a few minutes then headed back to rustle up some breakfast. On the way back down I took a spill down a slippery patch and unbeknownst to me lost my camera in the process. I didn’t notice it was missing until I had hiked another ten minutes. I ended up having to backtrack uphill and felt quite fortunate to locate the spot where I had gone down (I found a tree I had kicked to get the mud off my boots and backtracked from there). Back in camp I cooked up some cheesy broccoli noodles and picked out my next hike. I decided to head roughly in the direction of Little Annapurna and Dragontail peaks, knowing that I would probably opt for the more challenging Dragontail climb, but still keeping my options open depending on how the day played out. Heading west from camp the terrain stayed consistently mesmerizing and I probably could’ve been reasonably content to stay at any given location enjoying the scenery all day. In the distance across Perfection Lake is Little Annapurna. A walkup peak in the purest sense and nothing like the real Nepalese Annapurna, but still gorgeous. While I was up McClellan the goat family migrated uphill, or maybe it was a different family (McClellan in the background). I bumped into them again on my way toward the upper basin. Below right: looking across Inspiration Lake toward Prusik Peak. The upper basin of the Enchantments proved to be equally dazzling, surrounded by rock, snow, and patches of glacial water. I accidentally left my sunglasses in camp and realized early on that this was going to affect my climbing routes for the day. Gleaming snow fields would have to be avoided. But hey, any excuse to climb steep rock is a good excuse. Left: Witches Tower is the tower in the center, to the left of this is East Dragontail and to the right is Dragontail. Right: looking across Isolation Lake at Witches Tower, East Dragontail is off to the left. I’m not sure if East Dragontail is an official name or not, but that’s what a guy I talked to called it, so that’s what I’m rolling with. From a distance the rock at the base of Witches Tower looked plenty scramble-able so I circled around Isolation Lake with the intent of following the rock up to the higher ridge above. Up close there was a good bit of loose talus, some of it saturated with meltwater. Some fun scrambling to be had on the larger boulders but I also had to be somewhat wary of the grabbing a loose piece of rock as a handhold. When I reached the col between Witches Tower and East Dragontail I had hoped that an obvious route would present itself, but no clear paths were readily apparent. As I looked around I felt pretty sure that going straight up was not the normal route up to the ridge, but didn’t feel like hiking laterally to find an alternative. So I went straight up. Super steep but also full of solid grippy handholds and footholds. I kept at least three points of contact as much as I could and only really felt a little unsteady when hitting patches of lichen-covered rock. You can see the steepness and lichen-covered rock in the picture on the right (taken looking down about halfway to the top). Some adrenaline-charged moments but that made reaching the relative safety of a flatter summit even more rewarding. The next four pictures were taken from the summit of East Dragontail. Top left: Mount Rainier in the distance. Top right: Enchantments basin, Isolation Lake below, Prusik Peak and The Temple in the distance. Bottom left: Mount Stuart (which I went up last October). Bottom right: Little Annapurna. From East Dragontail I skittered down the much gentler south side, crossed the saddle over to Dragontail, and followed a well-worn path up to the summit (elevation 8840 ft) where a couple of people were just leaving. I talked with them long enough to find out that Witches Tower was a doable scramble and then they were on their way down Colchuck Glacier. While I was relaxing for a few minutes on the summit, a couple of climbers standing on top of Witches Tower bellowed at me from across the void. “Hey! Hey you on Dragontail! Wooooo!” I couldn’t help but laugh at their enthusiasm and waved back. Pictures from the summit of Dragontail Peak. Top left: The “tail” of Dragontail. Top right: Colchuck Lake. Bottom: Witches Tower and Isolation Lake, McClellan Peak in the background. I briefly toyed with idea of continuing to follow the ridge west over to Colchuck Peak but my legs were telling me otherwise, so I retraced my steps back up to East Dragontail. I found a well-travelled route down west of the summit and followed this back down, wrapping back around toward Witches Tower. The route I took up Witches Tower was a class 3 scramble but it looked like there would be many more amusing climbing options if you came equipped to do so. The views of course were spectacular but I was getting pretty tired and was feeling ready to put something resembling a meal into my stomach, so I didn’t stay long. Little Annapurna Peak was roughly on the way back to camp so I decided to pick off one last summit before calling it a day. I followed the footsteps of the guys who had earlier hollered at me from Witches Peak and tromped across Snow Creek Glacier before ascending the gentle upslope of Annapurna. Cheetos on the summit (elevation 8440 ft) were my reward and another stellar view. Rather than take the trail I had come up earlier in the day I decided that it looked slightly shorter to try to drop down to Crystal Lake (the lake in the bottom right corner of the right-hand picture above) and cut across. This didn’t work out too well as I ended up bushwhacking and clinging to pine trees as I slid down trail-free slopes. In the end I’m pretty sure my shortcut took longer than if I had just followed the original route. But then that’s what shortcuts usually do. I did get to enjoy a gorgeous view of the snowmelt plunging into Perfection Lake (below left). Right: Sprite Lake with McClellan Peak in the background. Finally back in camp I devoured a box of spiral mac and cheese slathered in pasta sauce, then relaxed watching mountain goats and reading for the remainder of the evening. No wind last night and I slept like a rock. Last day on our Enchantments permit and a long hike out to look forward to, but I still wanted to run up Prusik as far as I could get without climbing gear. I ate a hot breakfast, broke down camp, then stashed my pack and headed up the south side of Prusik Peak. A little eerie looking up at all those dangling slabs of granite. I imagine it’d be some gorgeous crack climbing though. I made it to the highest ridge below the final summit spires and knew there was zero option of safely going further. Straight up. Kind of nice when the decision is that clear-cut. Back at my pack I cooked up my last box of cookable food, cleaned up, and began the long hike back to the car. The hike out seemed to take forever, thump thumping down an endless trail and next time I’m sure I’ll opt for the shorter steeper trail in via Aasgard Pass. All told though it was a superb weekend in possibly the most beautiful piece of wilderness I’ve ever hiked through. This entry was posted in General on Thu 31 Jul 08 by Josh. Trip report from July 17-19, 2008 hiking up the Enchantment Lakes area of the Alpine Lakes Wilderness near Leavenworth, WA. This wilderness is renowned as one of the most beautiful hikes in the state and after visiting, I really can’t argue with that. Due to overuse of the Enchantments the Forest Service limits overnight camping via a permit system. I booked permits back in March, on the first day I was able to send in an application and, as it turned out, I couldn’t have asked for a nicer weekend. I reserved permits for a group of three, but ended up only being able to convince one person to come along (friend from work). I suppose this simplified logistics if nothing else. Posted below is an account of day one. I’ll post day two and three tomorrow or the next day. We took off from Yakima at 6:30 this morning and zipped up to Leavenworth in a little more than an hour and a half. The weatherman said clear and sunny for the weekend and the skies over the Alpine Lakes Wilderness were complying. In Leavenworth we stopped off at the Ranger station to pick up our reserved wilderness permits and grabbed a few last minute supplies (groceries, Jetboil fuel, bug spray) before heading for the trailhead about ten minutes down the road. The trail switched back and forth heavily from the get-go and my fully-loaded pack jostled robustly against my deltoids as we stomped upward. Lots of evergreen, lots of rock, and a stream running well below the trail. Snow Creek Wall (pictured below right) up ahead made a good progress landmark. We’d been warned that the mosquitoes were raging, but weren’t bothered at all in the early going. After a couple of hours of hiking over streams, boulder fields, and dusty trails, we reached Nada Lake (bottom left) and the first moment in the hike where things really became picturesque. The deep blue water was inviting, but we had a long hike to go and hypothermia to avoid. Pictured bottom right, these Columbine flowers lined much of the trail above Nada Lake. After cresting the boulder field above Nada Lake we had fairly level terrain to and around Snow Lakes. Snow Lakes is a popular camp spot with established sites overlooking the almost tropical-looking blue lake water. The mosquitoes were also camped here. Below left, the trail actually crosses at this dam between the Snow Lakes. Getting to Snow Lakes is certainly a full day of hiking in itself, but Enchantments was the goal and Enchantments it would be. 1500 feet of elevation gain to go from Snow Lakes. Lots of cascading waterfalls on the next steep stretch of switchbacks. And then suddenly we were scampering over a last stretch of rock and stumbling into a landscape that looked like it belonged in a Norwegian fjord, or a fairy tale. The first view you get as you top out is the picture on the left (cliffs above Lake Viviane) and then you swivel to the right and are peering up at a stunning spire of perched granite (Prusik Peak). I was recharged instantly and spent the next half hour scampering around the rocks above Lake Vivianne. How is that color water even possible? With our elevation gain largely done for the day, we set about finding a campsite, where the only difficulty we encountered was narrowing down our choices from all of the idyllic options. We eventually wandered past Lake Viviane across a sketchy-looking snow bridge and settled on a site on a peninsula within Leprechaun Lake with views of McClellan Peak across the water. I set up my tent, cooked up a little couscous for dinner (Jetboil is the greatest invention ever), then explored the surrounding hills for a couple of hours. Returning to camp I bumped into a family of goats who tagged along with me all the way back into camp. A thermos of Jetboiled hot chocolate and one sunset later and all was right with the world. Oh, and I should mention the toilets. These may be some of the best views from a toilet you could ever ask for. Hats off to the Forest Service. Left: gazing up at Prusik while you handle your business. Right: views of Snow Lakes taken from a well-placed toilet. This entry was posted in General on Wed 30 Jul 08 by Josh. For the most part I’ve pretty much found this to be true working in an office. Well, not my whole life, but my work life at least. Over time the little irritants become chronic pains. A coworker’s quirks begin to grate like nails on a chalkboard. You begin to anticipate how sluggish and out of sorts you’re going to feel at the end of the day and that anticipation just make it start a little sooner. Temperatures bug you. Signing Birthday cards bugs you. The sound of someone’s voice makes you want to punch them in the face. Or maybe I’m just being hypersensitive. I’m pretty sure Office Space speaks the truth though and I could probably find examples in my work space of every comedic moment in that movie. I honestly don’t know how anyone can stay with one job for more than a couple years. Anyway, yesterday was the first day in a long time that reversed the trend. I took a field trip up to Snoqualmie Pass to help out with wetland delineation work. This basically involved me driving in my car by myself for two hours listening to music, then walking around in the woods with a GPS unit (plotting wetland boundaries with a senior wetland biologist) for about seven hours, then driving back in my car. I was in shorts all day and sandals for about three hours (walking a stream). Not a case of the Mondays to be had anywhere. This entry was posted in General on Tue 29 Jul 08 by Josh. So, here’s the bit about the black bear that I ran into a couple weekends ago. I had just spent the better part of a Thursday (July 3) hiking into the Goat Rocks Wilderness (probably about 17 miles round trip) and climbing a fantastic scramble up 8201 ft Gilbert Peak. I was tired and thirsty and in full-on “head down, lurch back to the car” mode, cruising back on the trail, when I came around a small bend and looked up to see an adult black bear no more than twenty feet away from me. The bear had its back to me, was on all fours, and was munching on a shrub. It was stunningly unexpected and I froze for half a second while my brain accepted what the shape in front of me was (“Hmm, that kind of looks like a big version of Taylor. Oh wait, that’s a gigantic bear.”) and began rummaging over my imminent mauling. I took two short steps backwards (trying to tuck behind a tree) and whispered something to the effect of “Holy sugar muffins,” (except the shorter version of sugar muffins) while reaching for the digital camera in my pocket. Just as quietly as you can possibly say it. Just a little hiss of air. The bear snapped its head up at that same instant, looked me in the eyes, and grunted/huffed something that sounded a little like a bear being startled while munching on a shrub in the middle of a woods. “Hrrrumpf?” Now I don’t know anything about bear behavior, but in that heartbeat of a moment I set my course of action. 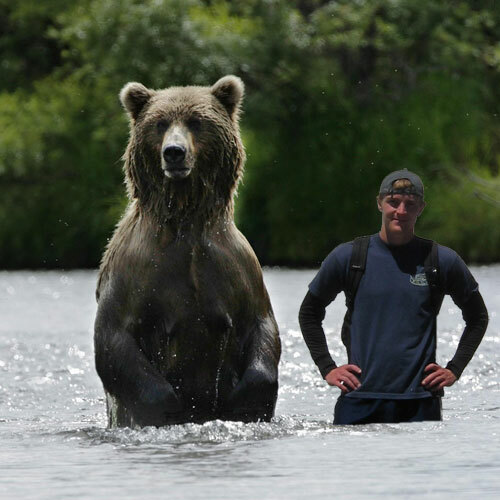 When the bear certainly charged I would get off one picture then grab my ice axe and start clubbing the bear. I remember feeling a little sad about having wallop on such a beautiful piece of nature, but in hindsight the bear probably wouldn’t have been the one that needed pity. But he didn’t charge. Or didn’t charge at me at least. He finished our brief stare down than bolted off in the other direction, his shoulders rising up and down as he crashed into the woods. I read up on black bears later and this is the normal course of action when confronted by a human. I stayed frozen for another second, weighing whether to step forward again to try to get a picture of the fleeing bear or whether to run like the wind down the trail. In the end I decided that since I had no idea if this bear’s less timid buddy was going to pop out from the woods behind me that I had better just get a move on. With a shot of adrenaline absolutely sizzling across my skin, I started a light trot down the path. I spent the next hour of hiking with nerves firing on hire alert, jumping at every bird or squirrel movement in my periphery. In the end I am incredibly grateful to have seen something like this in the wild. It was a gorgeous creature and moment I won’t soon forget. This past weekend didn’t have any bear drama, though this goat gave me a bit of a chasing (no, unlike the last one, this picture is not photoshopped). I spent three days hiking up in the Alpine Lakes Wilderness, easily the most beautiful area I’ve ever hiked through. Granite mountains and mountain goats galore. I’ll have many, many more pictures up in the near future. Prusik Peak pictured in the background. This entry was posted in General on Mon 21 Jul 08 by Josh. Dr. Horrible. Go watch! Oh Doogie, you’ve come so far. This entry was posted in General on Wed 16 Jul 08 by Josh.